A new game for your beloved Amiga was released on the 1st of June. 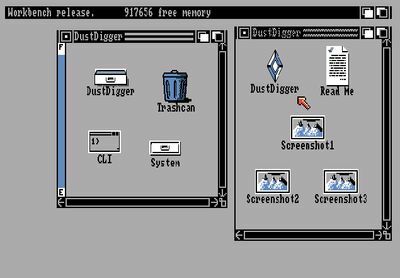 It is called Dust Digger and it is freeware. The author is Roy Schneider from Germany. 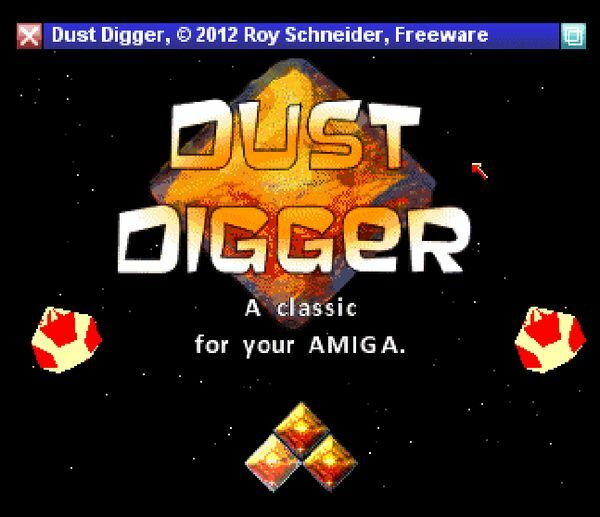 He originally created Dust Digger for the J2ME and Android platforms, but he decided to do an Amiga version as well. It is worth noting that Dust Digger has been programmed in 68K Assembler. Dust Digger is very similar to Boulder Dash. I love these kinds of games myself, so I’m definitely going to play it on my Amiga 1200. I haven’t tested the game thoroughly yet, but my first impression was positive. Looking forward to take the game for a spin. Looks pretty cool. I’ll have to check it out the android version since the amiga emus lag pretty bad on my comp. Sure does. 🙂 It’s a nice Boulder Dash clone. Sorry to hear that Amiga emulation is lagging on your computer. Please let me know how you like the Android version. Would be interesting to hear. Thanks for commenting. 🙂 Glad you like the post about this new Amiga game. Cheers!